The submaximal treadmill test is used to examine the cardiovascular health of athletes and those who may have heart disease. 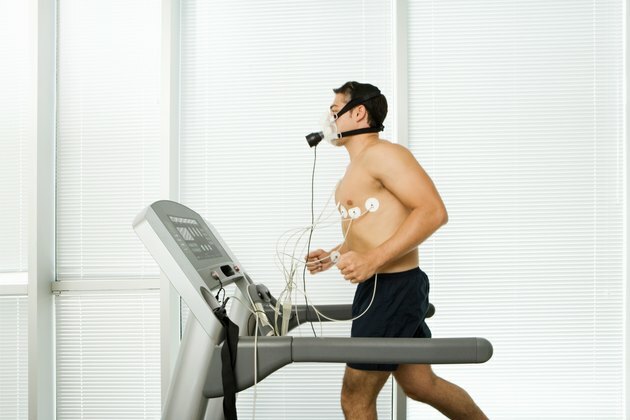 Also referred to as stress tests or tolerance tests, submaximal tests are used to examine an athlete's aerobic capabilities and to screen for possible heart or lung problems. Medical professionals use the Bruce and Ross treadmill tests. The Bruce test increases the treadmill speed during the test; the Ross test maintains a constant speed and instead increases both the speed and the incline of the treadmill. The test that your medical professional uses will depend on the reasoning for your test and your current health situation. Before your test begins, the tester will likely record your resting heart rate and blood pressure, to get your baseline values. The tester then places electrodes on your chest, torso and shoulders; it is likely that you will wear an oxygen mask to monitor your respiratory behavior. The electrodes are used to record the electrical activity of your heart. The treadmill will remain at 3.4 mph throughout the duration of the test. It will begin with zero incline but will increase, every 3 minutes, by 4 percent for men and 3 percent for women. If you are physically able, your test will last for five stages -- a total of 15 minutes. The Bruce submaximal treadmill test increases both the speed and the incline of the treadmill every 3 minutes. You will begin at a slow walk of 1.7 mph at an incline grade of zero. After the first 3 minutes, at stage 0.5, the grade is increased by 5 percent; it is increased another 5 percent at stage 1, which is 3 minutes later. Once you hit the 12-minute mark, both speed and incline grade will increase. At stage 2, or 12 minutes, the speed increases to 2.5 mph and the incline to 12 percent. At stage 3, the speed is increased to 3.4 mph and the incline to 14 percent. At stage 4, the speed is bumped to 4.2 mph and the incline to 16 percent. At stage 5, the speed bumps to 5 mph and the incline to 18 percent. At stage 6, the speed increases to 5.5 mph and the grade to 20 percent. Stage 7, the final stage, involves a speed of 6 mph and a grade of 22 percent. Throughout the submaximal treadmill tests, your heart rate, breathing rate, blood pressure, cardiac electrical activity and perceived exertion will be monitored and recorded. These values are then analyzed to check for any blood flow or respiratory limitations. How well your cardiorespiratory system is able to handle the exertion on the submaximal treadmill test will showcase the health of your heart and lungs; doctors use these tests to diagnose heart disease, according to the American Heart Association.